I tend to hear noises in my loft in the morining between approximately 5am and 7am - is this likely to be Squirrels ? - Yes ! Why have I got Squirrels ? - Squirrels are constantly foraging for food and safe, warm harbourage - your loft can be the perfect place! Aren't they pretty harmless really ? 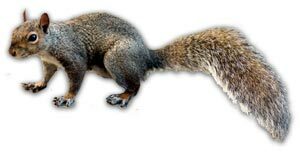 - Squirrels are voracious gnawers and can eat through timber, electric wires - pretty much anything really - they may look cute but you wouldn't want one in your loft!